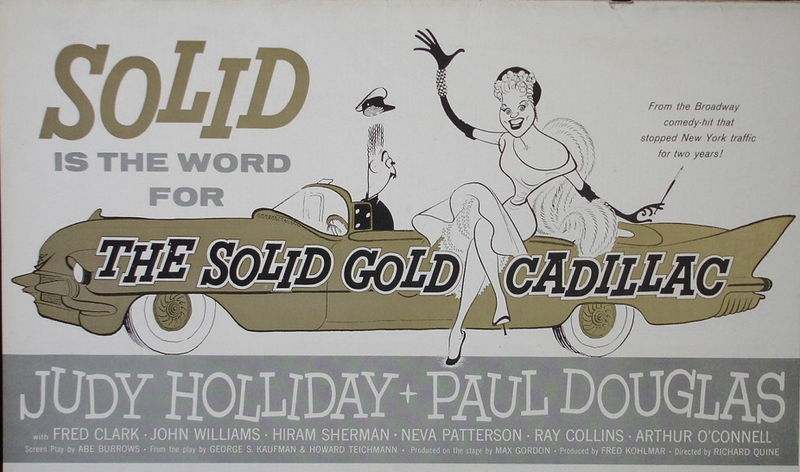 In the fall of 1956 a film called the Solid Gold Cadillac was released. The "star car" of this film was none other than a 1956 Eldorado Biarritz. Now if you run out and buy this movie hoping to see it full of vintage Eldorado Biarritz footage, you will be disappointed. The car appears in one 30 second scene at the end of the film. This film was shot on location in NYC and DC with the production wrapping up by the end of October 1955. 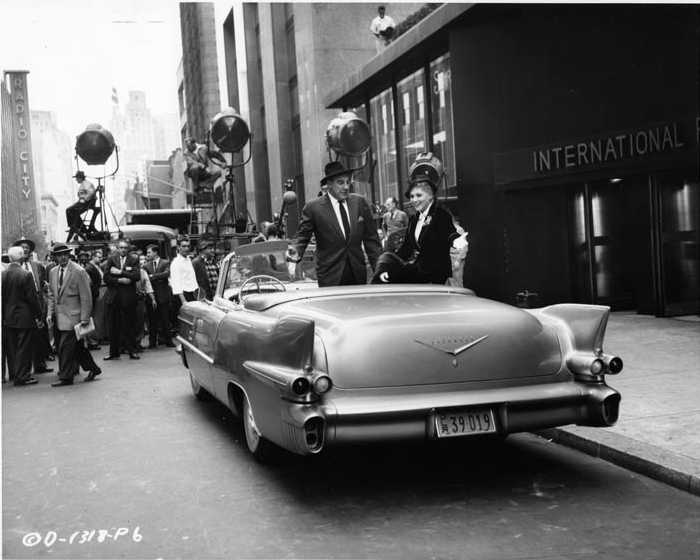 The Eldorado scene was shot in NY only. 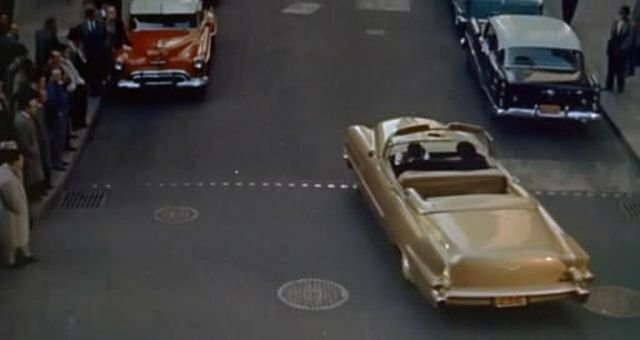 This timeline is important because it tells us that the Eldorado Biarritz used in this film must have been a very early build car. No one was sure if the car would be ready! When the time came to film the final and most important scene of the movie, neither the producers or General Motors knew for sure that the Eldorado was going to be there. Even executives at Colombia Pictures were nervous according to a NY Times article that ran on Nov 6th, 1955. What was the hold up you ask? The producer of the film, Fred Kohlmar insisted on authenticity throughout the film. 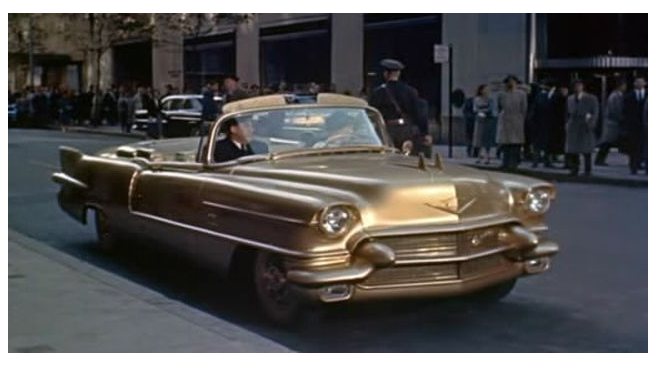 He wanted a Cadillac that looked like solid gold! This was no small order. He had to go to the top of G.M. to make this happen. 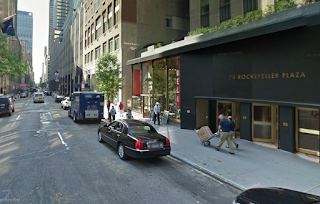 Fortunately General Motors owned and operated a Cadillac Dealership in Manhattan so logistics wasn't going to be a problem. Painting the entire car the correct shade of gold was the big problem. To achieve the look the producer wanted the car was painted with gold powder mixed into lacquer, this process is similar to how gold picture frames are done. When the car was done, G.M. asked for the producers to come and have a look at the car and approve the color. To their dismay, the producers thought car wasn't photogenic enough, it was too dark. So after fifteen variations of gold were tried by G.M, the correct shade of gold was finally reached! Just about every square inch of the exterior of the car was sprayed in this gold paint. The interior of the car was covered in cloth that was sprayed with the same paint. Color pictures from the IMCD. It took six men over 52 hours to complete this project with the cost estimated to be $700, this is just over $6000 today! 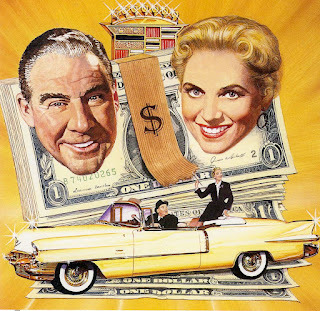 This doesn't take in to account the cost to convert the car back to sellable condition. G.M made it very clear not to expect to see this color on the showroom floor because the gold paint does not stick to the chrome well. Here is one more picture from the NYC shoot. It's a great shot of the car on West 51st street in Manhattan with Radio City Hall in the background. The area today is pretty much unchanged. 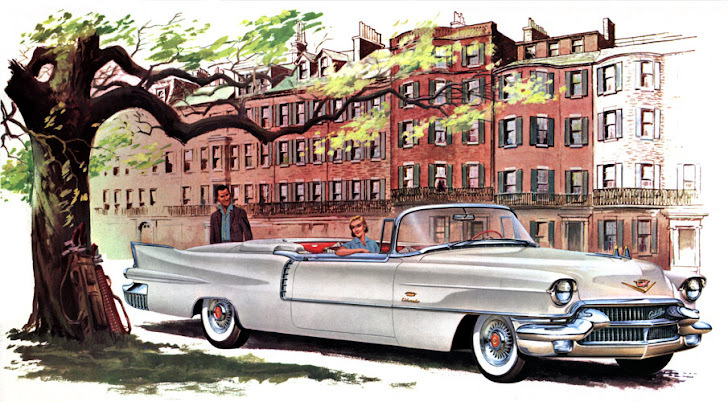 In this 1955 picture, take note of the NY dealer license plate and lack of an autronic eye on the dash. Was there more than one Solid Gold Cadillac? I believe there was. 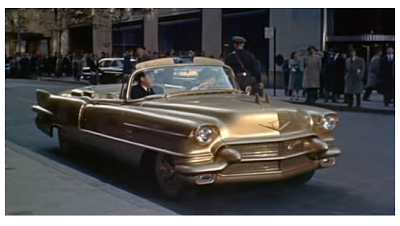 There was the gold painted car that was used in the movie filmed in 1955 and another car used in the publicity photos taken in early 1956. The car in the studio pictures was not painted in custom gold paint. 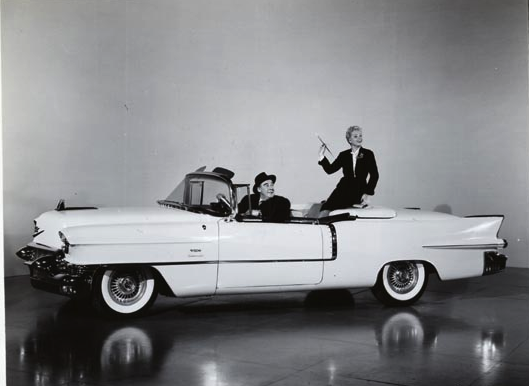 It was a standard Goddess Gold car with black and white trim as you can see in the pictures below. This car has an autronic eye as well. Check out the over exposure of the picture to give the car an overall gold look to it. State of the art photo editing in 1956, laughable by todays standard. Another picture from the photo shoot. Clearly not the same car used in the film. What happened to the car after the movie? but in the end. 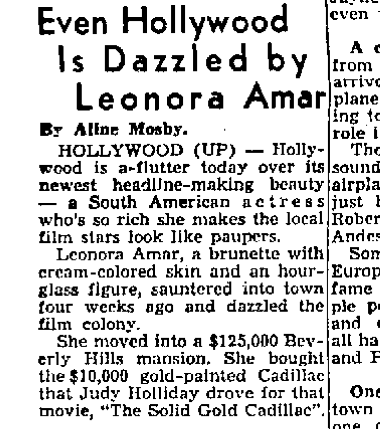 She did not have much success in California and returned to Mexico. What happened to the car when she moved back to Mexico is murky. The trail picks up again in the mid 1980's. 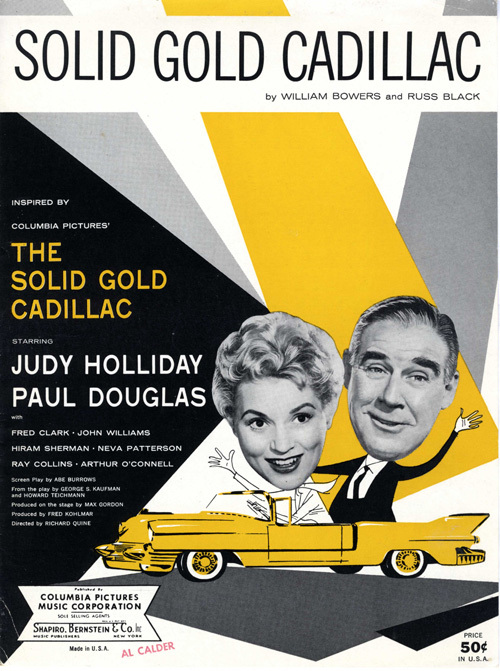 A recent report from a reliable source tells me that the Solid Gold Cadillac did survive and is in Arizona. It was in very rough shape. A restoration was started but there was trouble with the restoration shop and the car was pulled from the shop. Restoration was completed at a later date. 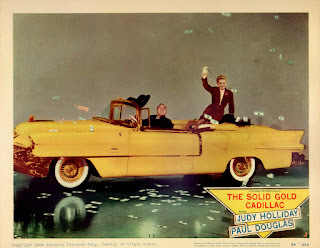 The owner at the time claimed to have full documentation proving that this was indeed the Solid Gold Cadillac Eldorado. 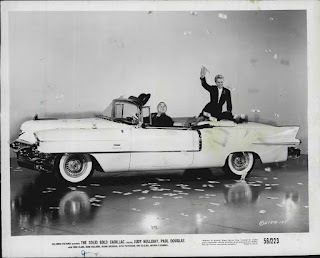 It is believed that this car is still in Arizona. To date no current pictures have surfaced. 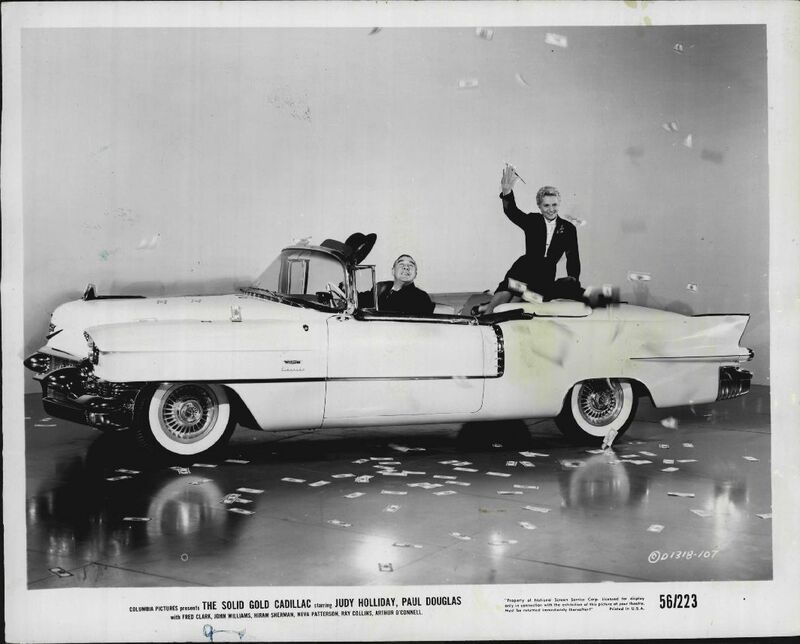 Is this the movie car or the photo shoot car? Perhaps bringing this story to light might help us find out more about this car in AZ. As the ad below reads, "Solid is the word". Folks, lets find this car!